Conservatives warn the speaker’s fate could be determined by how he handles the next seven days. Close allies of Speaker John Boehner are worried that his conservative rivals could move to oust him as soon as next week. Removing a sitting speaker is exceedingly difficult, and such an effort would almost certainly fall short. Yet growing speculation about the possibility of it – coming after Friday’s embarrassing defeat at the hands of conservatives and House Democrats on the homeland security battle — shows how vulnerable the speaker has become. Five years into the job, he’s a leader consistently buffeted by forces beyond his control. The legislative calendar guarantees it won’t get any easier: in the coming weeks and months there will be battles over the debt ceiling, budget, taxes, and spending cuts. 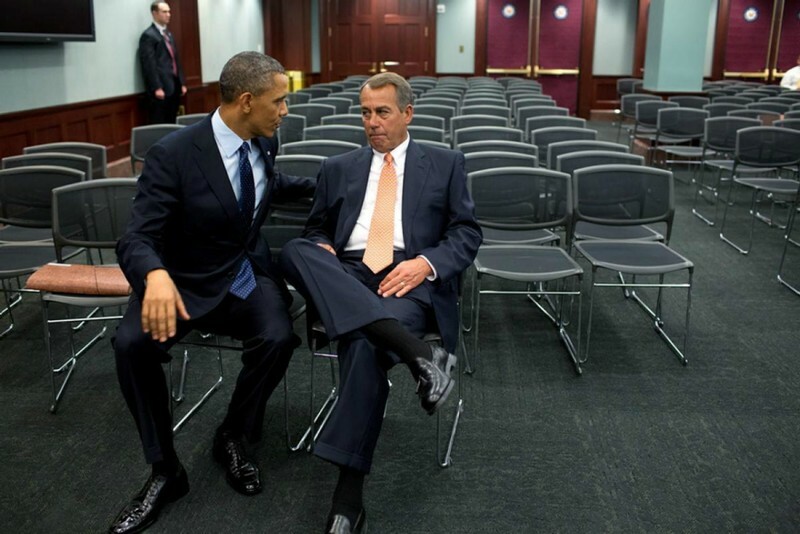 The question is how many more of these episodes Boehner can withstand. Frustration with the Ohio Republican is mounting after dozens of hardliners voted Friday against his three-week funding package for the Department of Homeland Security. Hours of frantic leadership meeting ensued. After some backroom maneuvering with Democrats, Boehner was able to push through a one-week bill to keep DHS open. President Barack Obama signed the bill into law just 10 minutes before a shutdown of the massive federal agency. The stinging rebuke of Boehner on the House floor infuriated his supporters, who accused opponents of handing Democrats a huge PR victory. Yet is also left even Boehner backers wondering how viable he remains. They admit these repeated confrontations, in which Boehner can’t muster 218 Republican votes for his proposals and has to turn to Democrats for help, leave him looking weak and ineffective — and thus vulnerable to a conservative challenge. While there’s no open movement afoot to replace Boehner, his allies are plainly nervous that GOP hardliners might try. Members of the recently formed “House Freedom Caucus” offered multiple proposals to leadership that they believe would have drawn enough Republican votes to keep DHS funded and not left Boehner dependent on Democrats. Boehner, though, chose not to support the plans. One conservative member, who asked for anonymity to speak frankly, said the mood of his colleagues will depend on how Boehner handles himself over the next week. If he tries to put a “clean” DHS funding bill on the floor for a vote, or doesn’t make overtures to conservatives, anger could boil over, the Republican said. The lawmaker said he will be watching closely the three dozen or so members who voted for Boehner during the speaker election in January but who have been critical of the GOP leadership team’s tactics. A handful of Boehner loyalists met with him Friday night and voiced concern about behind-the-scenes agitation among the most conservative faction of the conference. The chances that an attempt to remove him would succeed are virtually nil. But it would show that his critics are willing to risk a split within the GOP Conference to force him out. House Speaker John Boehner of Ohio listens during a news conference following a meeting on Capitol Hill in Washington, Wednesday, Feb. 25, 2015. Boehner said he's waiting for the Senate to act on legislation to fund the Homeland Security Department ahead of Friday's midnight deadline. How Boehner would respond to such an effort is anyone’s guess. It’s seen as highly unlikely he would step down. Yet he’s also shown no inclination to seek a showdown with his GOP critics or move against them by taking away committee assignments, cutting off campaign money, or endorsing primary challengers. Such tactics might actually help the rebellious lawmakers by boosting their profile with conservative groups, which despise Boehner. All of which leaves the House GOP stuck in its current rut: run by a weak speaker, lurching from crisis to crisis, and burdened with an internal opposition that has a strong ideological position but no actual plan to govern. Unhappiness with Boehner has been growing since the end of last year. He decided then to move forward with the so-called “cromnibus” that funded the government through September, except for DHS, which received money only through Friday. The idea at the time was to avoid another damaging government shutdown — and then use homeland security financing as leverage to force President Barack Obama to back away from his actions to shield millions of illegal immigrants from deportation. Instead, conservatives believe Boehner left them with less leverage to scuttle the president’s immigration policies. But it’s one thing to disapprove of Boehner’s leadership. Booting him is another matter. House Speaker John Boehner is pictured.